Store in a cool dry place. Once opened, keep refrigerated with slip lid on and use within 6 months. 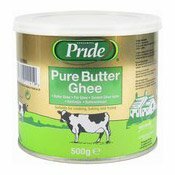 Ingredients: Butter Ghee (Milk) (100%). Simply enter your details below and we will send you an e-mail when “Pure Butter Ghee (Clarified Butter) (派牌印度酥油)” is back in stock!